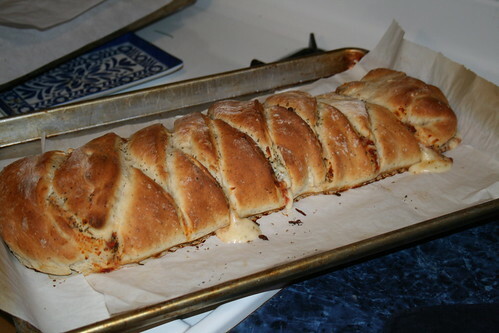 Yesterday, for supper, I made this pizza braid. So good! Everyone loved it. We’ll be making it again. I must say, I altered the recipe a bit. Instead, I spread some crushed tomatoes down the middle of the bread. I sprinkled the tomatoes with dried basil, dried oregano, and garlic powder, then spread 2 cups of mozzarella over the tomatoes before braiding the bread. You could use just about any kind of filling in this. Next time, I want to make the filling with hamburger, taco seasoning, and cheddar cheese. You can visit this site for pictures to guide you through braiding the bread. The site has lovely and helpful pictures. And it’s very easy to do. It makes a great meal and one your kids would love to help you with. 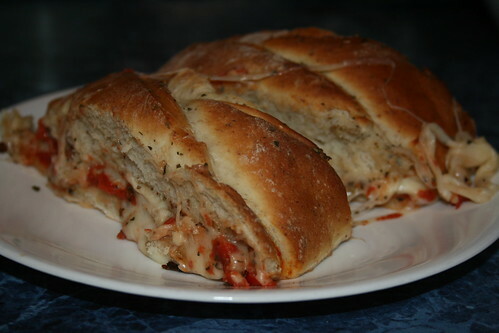 This entry was written by ~~Rhonda, posted on November 10, 2009 at 10:08 pm, filed under Recipes and tagged pizza, pizza braid, Recipes. Bookmark the permalink. Follow any comments here with the RSS feed for this post. Post a comment or leave a trackback: Trackback URL. I saw this on your menu and I’ll be going to try this too for us! 🙂 Can’t wait! I’ll share pictures too on Facebook.